One more move. You seize your opportunity... As you push the shining line of marbles, tipping your opponent's colour over the edge one final time, you know you've won at abalone. The six you need to win sit on the sidelines, in the gutter. Your victory is clean. Black and White. Next time will be different, as you penetrate deeper into abalone's spell. Sharpen your attack and round off your defence. Look. Plan. Weigh up you options with every move. 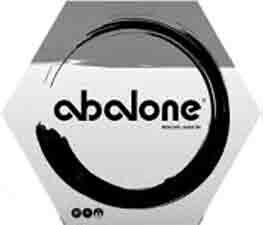 Abalone is a similar to other great abstract strategy games. Simple to learn and understand the rules but difficult to master. Abalone is played on a cleverly designed hexagonal board with circular recesses in which marbles can rest. The two teams of marbles (white and black) set up on opposite sides of the board. Each turn you can move either a row of 1,2 or 3 marbles 1 space. The board design allows easy movement of the marbles. The best analogy is that of Sumo wrestling, each player trying to push the opponents marbles off the edge of the hexagonal board. You are only allowed to push your opponent�s marbles if the row that is pushing is longer than the row defending. This means a row of 3 or more marbles is a solid block. Unfortunately it is not feasible to protect all your marbles from all directions � and you also need to be pushing your opponent�s marbles. The resulting dynamic movement of the marbles as one side tries to outmanoeuvre the other gives the game a quite unique feel. Often one player may be pushing a group of marbles towards the edge of the board over a series of moves � only to find that the threatened marbles are able to extricate themselves out of the way. All of a sudden the pushing pieces can find themselves close to the edge of the board and exposed to a counter thrust by the other side. This is not unlike the Sumo wrestler who finds his own pushing momentum being used to throw him out of the circle! If you like classic strategy games such as chess, draughts and othello you will love Abalone � it also makes an attractive feature for you coffee table! !